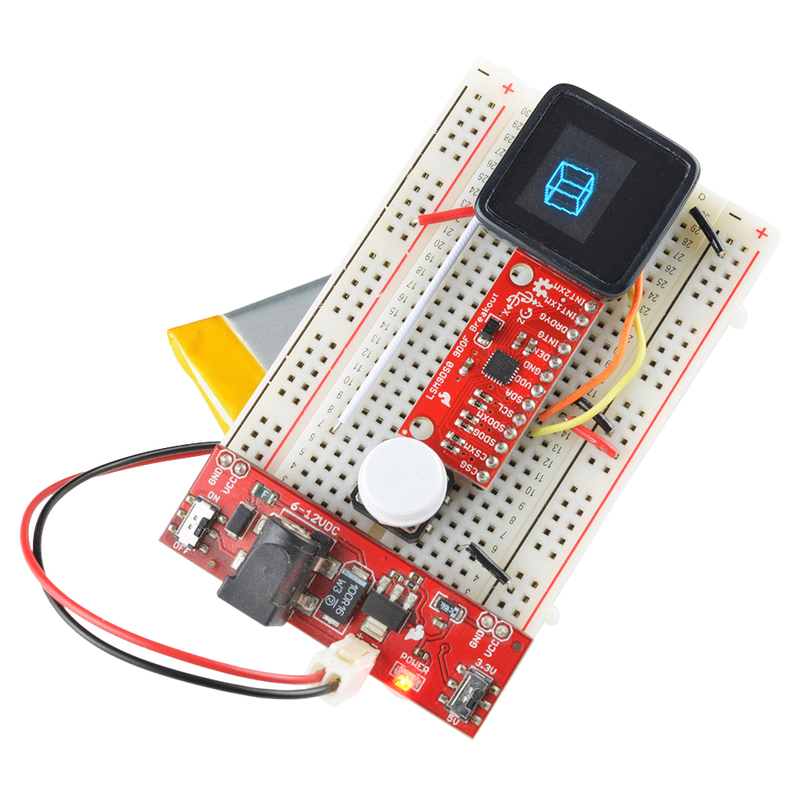 I'd like to use my Enginursday post to chat about a new project our SparkFun team is working really hard on these days -- something I'm super-excited about -- the MicroView! The MicroView is a collaborative project between SparkFun and our friends JP, Marcus and Maddy from Geek Ammo, the team behind the Ninja Blocks and Little Bird Electronics. 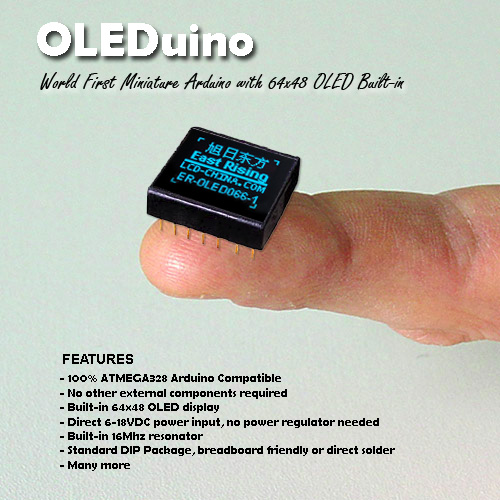 *OLEDuino not actually a thing. A completely fabricated, photoshopped image of a chip with a built-in OLED display. JP got Marcus hook, line and sinker, and Marcus instantly wanted it! When finding out that he couldn't purchase this awesome new product, Marcus, not to be let down by JP's prank, convinced his team to make the MicroView a reality. The Geek Ammo team has put the MicroView up on Kickstarter, and we've been working with them along the way, helping where we can with PCB design, part sourcing, manufacturing, and eventually reward fulfillment (this ain't our first Kickstater rodeo). Check out their Kickstarter video! 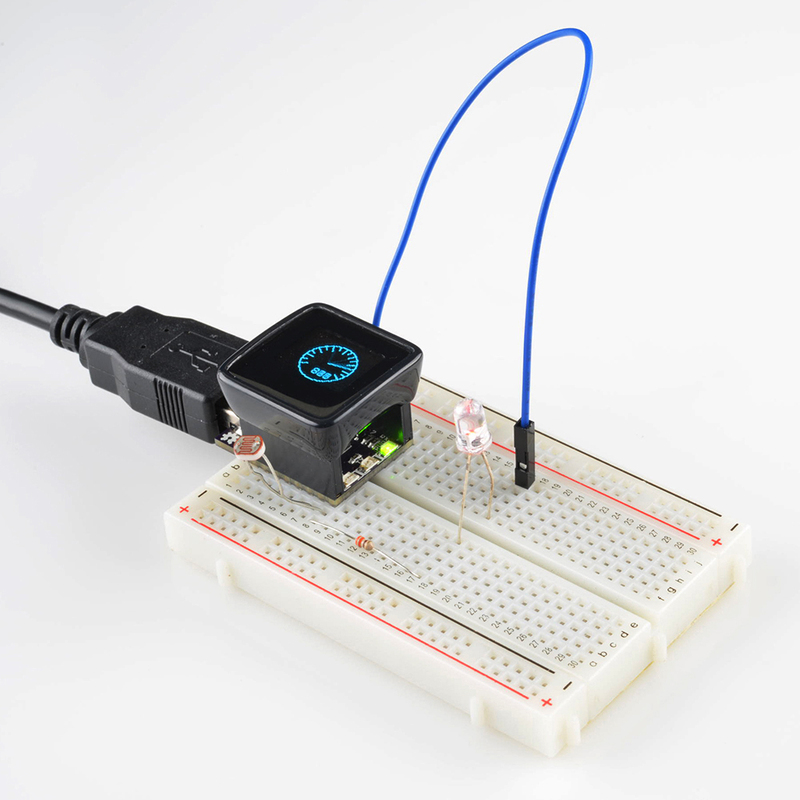 What's awesome about the MicroView is its utility for electronics beginners and experts alike. For beginners, the MicroView is one of the easiest-to-use Arduino platforms available -- it's perfect for anyone looking for an education in electronics, programming, or Arduino. The integrated display really helps to visualize what the microcontroller is doing (you might say it gives you a view into the microcontroller). The MicroView will even ship with built-in tutorials to help folks get started; and the Geek Ammo team has built a set of cross-platform, interactive tutorials that teach you how to create 11 different circuits. The MicroView is also great for experienced electronics users. It uses an ATmega328P chip -- just like the Arduino Uno -- and runs at 5V/16MHz. It breaks out a dozen I/O pins, including six analog inputs (A0-A5) and 3 PWM outputs. The projected pinout of the MicroView. And, of course, the MicroView should have a bright future as the center-piece of finished projects. Smart watches, geo-cache sniffers, mobile breathalyzers...you name a project, I'm sure we'll see the MicroView integrated into it soon. Right now we're in a prototyping stage with the MicroView. We've got some functional boards and enclosures, and (not to brag or anything) I've been lucky enough to get to start playing with them testing them out. They're awesome! If you want to get in early on the action, go back it now on Kickstarter! My only concern is how long will the display last. I have equipment in my house that uses OLEDs and after a year of uses, you can barely read the display. No SPI broken out..... What about I2C (Preferably hardware based I2C)? The SPI interface appears to have been dedicated to the display. Pins 11, 12 and 13 are nicely tucked under the glass lid and OLED. Another I/O pin is normally used to chip select another slave SPI device. It looks like pin 4 is being used to turn on/off power to the display. Pins 2 (SCA) and Pin 3 (SDA) look like I2C bus connections. Do you know if the wire library is supported? The MCP23017 â i2c 16 input/output port expander would definitely create lots of I/O pins for more complex projects. Yes the wire library is supported. The microview is based on the ATMega328 meaning the I2C lines are on A4 and A5. The videos and pictures show MicroViews running without attached components (on fingertips). Is there a battery hook-up or is it just an image to show the size and the possible graphics? There are micro-wires going to a battery that was taped to behind my arm. Awwwww... I was REALLY hoping this might be a little better than a 328p stuffed inside... No ATMEGA32U4? C'moooon! Leonardo is an Arduino too! No need for classics like the 328p when the 32U4's around... ... Right? Riiight? anyone have a link to a complete pinout and schematic? This looks great! I love the necklace here: https://s3.amazonaws.com/ksr/assets/001/729/494/a53a8d25d4579ed7322a7c33b5bc3d40_large.gif?1394454823 I can't imagine wearing one though, with the pins poking and scratching my neck. Maybe it would be better with female headers. Double headers (like these: https://www.sparkfun.com/products/117 ) could be inserted to put it in a bread-board. For small projects male jumper wires could be inserted. Perhaps the female headers could be parallel to the face so jumper wires could be inserted while it is laying flat on the table and right angle headers inserted for bread-boarding. Can't wait to see these in production. Are there any plans for a larger version, with more/all of the pins broken out? Are there any other versions being planned ...period? I don't know if it's of any interest, but I designed a thing I call LCDuino as a response to the same issues. It's what you get when you mash an Uno and an AdaFruit RGB backlit 2 line LCD shield together and cram them into an 80x36 mm space. I know that SF is going to be doing the building on these -- is the "long term" plan to sell them as well? Hope so, as I'm sure folks will come up with more ideas after the Kickstarter period has ended. Is the SSP broken out somehow? (To allow rewriting the bootloader, at least...) The pinout shows four digital I/O pins, of which three are PWM. That means the SPI port isn't (apparently/entirely) broken out as two of the lines (MISO and SCK) are neither analog inputs nor PWM outputs. Is there an alternate means of accessing the SPI port? Unfortunately neither SCK, MISO, or MOSI are accessible when the board is enclosed -- just not enough room to break them out. They will be broken out on the PCB though (we'll need them to program the ATmega's in production). On our prototypes they're broken out to a small 0.1"-pitch, un-populated header. It's not too too hard to safely remove the cover from the enclosure to get to the PCB, so it'll definitely possible to access the SPI port. Jimb0, that is weird, i'm a backer since the begging on the kickstart campaign, and i'm watching closely the discussion, and JP said in one comment that the enclosure would be "hard" to remove. 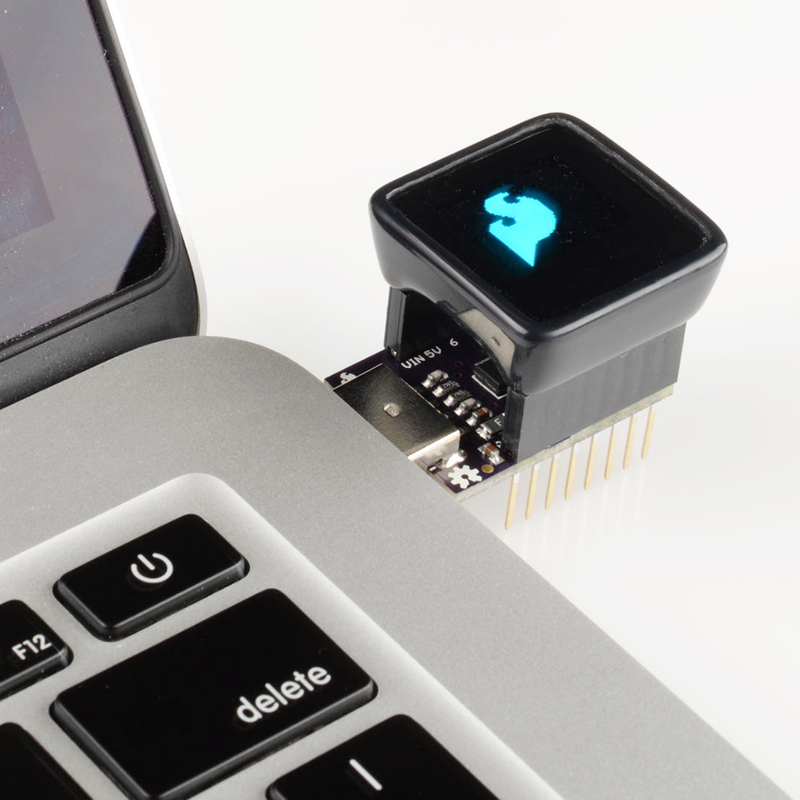 Nevertheless MicroView is a awesome product and i'm anxious to get mine! JP's right. It's definitely designed to be kept in place, there are protruding snaps on opposite edges of the cover that hold it solidly into place. For the hacker-types, though, it's do-able (I've had some practice this week :), but it is bound to leave some scuffs. You'll see when you get yours (thanks for backing! ), but you can wedge a thin flathead between the screen and enclosure to pop it off. Nothing else easily accessible as of now (but soldering wire-wrap wire to TQFP pins isn't too hard, right?!). It's a tight layout, but we'll see what else we can fit on there! The display is on the SPI. :) I'll try to follow the Limb0 tip and solder a tinny wire directly to the atmega pin. The reason I thought the SS line would be free is 'cause when you're programming the ATMega you wouldn't want the display to think you're talking to it... So I would expect some other ATMega I/O line is being used for the display's slave select, and thus the ATMega's SS line is probably free. 'course I could be wrong. Could be they're programming the boards without the display connected or something. Got a better link, this one seems dead. Yes. There was no question of whether the SPI port was connected to the display - the only question was which lines of the SPI were used and which weren't. Given that a lot of displays are write-only, there seemed a fair chance that the MISO line, accessible on the ISP header, might not be connected to the display. But as it turns out the MISO line is connected to the display's reset line. Oh well. I guess it's back to QFN soldering if I want to hack this thing. What about a right angle header in the crotch of it to breakout the SPI? What about making the surface touch capable? In other words, the whole surface acts like a pushbutton? Personally I'd rather have the simplicity a good old fashion button or two, if there's some input added to this thing in the future. But yeah, touch sensor would be a cool alternative, and possibly more compact. I'm right there with AgustinGS. I jumped on this bandwagon early, and I'm thrilled to see the ridiculous amount of backer funding they've already generated. And I, too, wish I had a spare dump truck full of money to trade for a dump truck full of MicroViews! Yup, I agree, and have already contributed. love the idea of it, I just wish I had tons of money to but a whole lot of them! Does anyone know if there'll be a product page with a "getting started" section? I highly doubt it'll just automatically start displaying my sensors data..
there will be more documentation than you know what to do with. Jim can comment further, but there's already a lot of good documentation and libraries to make it pretty easy to use. Once the dust settles from the kickstarter and things start shipping, we'll have at least a basic tutorial to guide you through using the microview. So, when will they start shipping? When will spark-fun preorders go up?